In 1941, Walt Disney and a group of artists from his studio took a goodwill tour of South America … and they had a good time. Walt and El Grupo is a well-made documentary about this historical footnote, but it suffers from a lack of dramatic tension. At the time, the United States government had adopted the Good Neighbor policy. The idea was to use the soft sell to gain the support of Latin American countries, as opposed to the repeated military interventions of prior decades. In 1941, the government invited Walt Disney to visit South America on its dime. He agreed to go if he could bring along studio artists to get material for future projects. Much of the story is told through archival films, photos, and art. All of those who took the trip are dead, so their voices are heard through their letters and journals read by their descendants. Some South Americans who met members of the group fill in some blanks. Other modern interviewees put the trip into historical context. 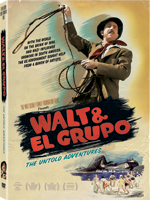 It seems that the South Americans were gracious hosts and Walt was a good guest — archival films and photos show him awkwardly folk dancing with the locals, trying on a gaucho costume and generally being a good sport. The filmmakers try to create tension by examining problems at the studio. It had lost money on Pinocchio and Fantasia, and the Second World War had put a large dent in profits. Additionally, a strike by studio employees was in progress when the group left. It’s hard to feel bad about lost profits when there were people dying by the thousands in Europe and Asia. From a present-day perspective, it’s hard to feel concern about the studio’s continued existence. Aside from fond memories, the lasting legacy of the trip seems to be its impact on Disney’s artists. The movies inspired by the trip are distinctively Disnified, but exposure to new sights and cultures took their work in new directions. The film singles out Mary Blair, a concept artist for the studio. Her pre-trip watercolor street scenes are contrasted with her later works which have a flatter, more-stylized look and vivid colors. It’s fun to look at the art that arose from the trip and to hear different perspectives on the trip. Beyond that, there isn’t a great deal of historical significance here. This movie is for Disneyphiles only. Saludos Amigos (43 minutes), is presented in its entirety, with no chapter stops. It’s typical of the studio’s output of that era. Donald Duck has misadventures at Lake Titicaca. Goofy has misadventures as a gaucho in Argentina. The last segment, Aquarela do Brasil, moves beyond the gags. An animated brush creates a watercolor jungle, flowers sing and morph into jungle creatures, the whole rainforest pulses to the music. Director Theodore Thomas and animation historian J.B. Kaufman (who appears in the film) have plenty to say on the commentary track. Thomas talks about the sources of archival materials, the film of the travelers leaving the studio and boarding a plane was made after the trip was completed, for instance. In general, they do a good job of filling in details rather than telling viewers what’s already on the screen. There are three deleted scenes, about 10 minutes in all. The most interesting one focuses on Urca, a casino in Rio de Janeiro that makes an animated appearance in Saludos. It was a hot spot in the 1930s and 1940s, but was closed in after gambling was outlawed in 1945. Modern footage shows the inside the long-abandoned building. For a movie with old archival footage and modern talking heads, the picture and sound are as good as can be expected. Watch the movie, then watch Saludos Amigos to see the results of the trip.